This sequence is designed to help you improve your posture, especially if you tend to slump forward. Because this is a rather long practice, feel free to shorten it by only doing the dynamic versions of yoga poses that offer both options some days and only doing static versions of poses that offer both options other days. You could also just pick three poses to do when you are short on time. I also encourage you to work up to longer holds of static poses, from 90 seconds to two minutes because long holds of static poses can permanently change both muscle and fascia length, which will really help with improving posture. In this yoga pose your spine is more neutrally aligned just by virtue of you lying on your back. And moving your arms and shoulders up and overhead tends to open your upper back and encourage gentle backbend (extension) action of your upper spine. Start by coming into Supta Tadasana (Reclined Mountain Pose) with support under your head. Engage your legs and on an inhalation, swing your arms up and overhead alongside your ears. On an exhalation, swing your arms back down to your sides. Staying in the pose for a longer hold provides more stretching of your front chest. To come into the pose, follow the instructions for the previous pose. With your arms alongside your ears, focus on lengthening from your hips to your hands, sensing a small amount of backbend in your spine. In this pose, some people can get their hands to the floor while others cannot. If you can’t bring yours to rest comfortably on the floor, try resting them on a block or folded blanket instead. If you’re new to the pose, hold for just 30 seconds and gradually work up to 1 to 2 minutes over time. To come out of the pose, on an exhalation, swing your arms back down by your sides. Since tightness at the front and back of the hips could contribute to poor posture, I recommend adding in this pose to stretch your hamstring muscles (backs of your thighs). If you’re new to the pose, hold for just 30 seconds and gradually work up to 1 to 2 minutes over time. 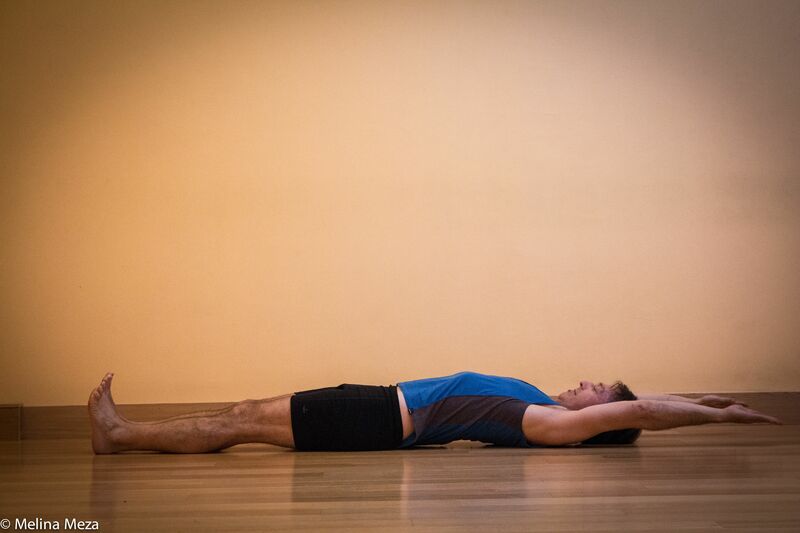 Start in Constructive Rest Pose, lying on your back with your knees bent and feet on the floor. 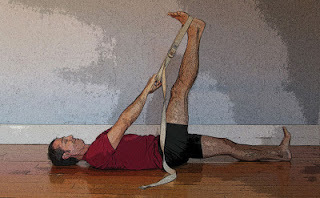 With a strap in hand, bend your right knee into your chest, place the strap over the arch of the right foot and straighten the right knee, stretching your foot toward the ceiling, keeping some tension on the two sides of the strap. Walk each hand up the sides of the strap until your arms are straight. Slide your bottom leg long on the floor, straightening your left knee and pressing out through your left heel. Adjust the angle of your right leg forward or back until you can easily keep the right knee straight and still have a feeling of stretch in the hamstring and calf of the right leg. Relax your shoulders, and make sure your lower spine is either softly touching the floor or slightly arched away from it (and is not jammed into the floor or over-arched). After you have aligned yourself, bring your attention to the sensations in your body or follow your breath. To come out of the pose, bend your right knee, slip the strap off your foot, and lower your right leg to the floor. Then place the strap aside and shake out both hands for a moment. Repeat on the second side. When you’ve finished both sides, bend both knees and come into Constructive Rest Pose for a few breaths. This pose helps to release stiffness in your entire spine, including the upper back (thoracic area). To set up for the pose, place a folded blanket crosswise in the middle of your mat to cushion your knees. Then come into a hands and knees position, with your knees on the blanket and your hands on the mat. Align your hips directly over your knees and your shoulders directly above your wrists. Now, evenly spread your palms and fingers, and press your hands into the floor. To keep your arms straight, firm the muscles around your elbows. While keeping it parallel with the floor, lengthen your spine from your tailbone to the crown of your head. To come out of the pose, after completing a set of dynamic Cat-Cow, simply sit back on your heels. This is the first position in the dynamic sequence of Cat-Cow. It takes your spine into a backbend, strengthening your back spinal muscles, while stretching the front of your belly and chest, and encouraging a full inhalation. To come into the pose, as you start your inhalation, gradually arch your spine into a backbend shape. Start by moving from your pelvis, lifting your tailbone and sitting bones up as your pelvis tips forward over your leg bones, relaxing your belly and lower back down, and lifting your chest and head forward. Keep your chest lifted and your collarbones broad as you continue pressing your hands into the floor and firming the muscles around your elbows. As you move, focus your attention on the smoothness of your breath and sensations that arise. When you’re ready to exhale, you’ll move into Cat Pose. This is the second position in the dynamic sequence of Cat-Cow. It takes your spine into a forward rounding position, which strengthens your abdominal and front chest muscles, while stretching your back muscles and encouraging a long exhalation. To come into the pose, as you start your exhalation, gradually round your spine toward the ceiling. Start by moving from your pelvis, turning your tailbone and sitting bones down as your pelvis tips backward, hollowing your belly towards your spine, and releasing your neck and head toward the floor and looking back to your knees. Keep your neck relaxed as you continue pressing your hands into the floor and firming the muscles around your elbows. As you move, focus your attention on the smoothness of your breath and sensations that arise. When you’re ready to inhale, you’ll move back into Cow Pose. If you’ve finished your final round, inhale and return to the starting position instead. To come out of the pose, after completing a set of dynamic Cat/Cow, simply sit back on your heels. This standing version of reclined pose will continue to stretch front body tightness that might be contributing to poor posture while also strengthening your upper back muscles to help maintain your improving posture. Follow the instructions for Dynamic Supta Urdhva Hastasana (above) while standing in Tadasana. This will increase the stretching and strengthening effects of the dynamic version. If you’re new to the pose, hold for just 30 seconds and gradually work up to 1 to 2 minutes over time. This yoga pose increases the backbend from the last two poses, increasing both the amount of stretching in your upper chest and strengthening in your upper back. Stand in Tadasana in the center of your yoga mat. Step your feet out about 3 feet, toward opposite ends of your mat. Turn your right foot 90 degrees, to face the end of your mat. Rotate your left leg internally, turning your left foot so that it angles mostly toward your right foot. Your pelvis will be facing forward now, toward your front leg. Begin with your arms down by your sides. Then, on an inhalation, sweep your arms up overhead so that your elbows are straight and your palms face each other. On an exhalation, bend your right knee so that your knee is directly over your heel. On your next inhalation, straighten your right knee to come back up. As you exhale, release your arms down by your sides again. Repeat this sequence five more times. Then repeat the sequence for six rounds with your left leg forward. Holding Warrior I for longer times will increase the opening effects on your upper chest and spine. If you’re new to the pose, hold for just 30 seconds and gradually work up to 1 to 2 minutes over time. Follow the instructions above for moving into and out of the pose, but instead of working dynamically, stay in the pose for 30 seconds, breathing in and out the entire time, before coming back up. Because tightness in the front of your hips can contribute to poor posture, this pose stretches the fronts of your hips and thighs and balances out the work of Reclined Leg Stretch Pose. Start by standing in Tadasana at the front end of your yoga mat. Next, come into an easy Standing Forward Bend (Uttanasana), placing your fingertips on the floor or on yoga blocks. As you bend your right knee, keep it positioned directly above your front ankle joint. Step your left foot back far enough (3-5 feet, depending on your height and leg length) so you can straighten your left leg. Keep the ball of your foot and toes of the back foot on the ground, and keep your toes pointing straight forward. Position your arms parallel with your front shinbone, pressing your fingers or hands down while simultaneously lengthening back up your arms toward your shoulders. In basic High Lunge imagine a straight line moving from your back heel through your back leg and spine and out to the top of the head. Actively firm and fully straighten your back knee joint. Press down firmly into your front foot to activate the supportive muscles of the front leg without going to the point of straightening the front knee. Imagine lengthening the front surface of your body from your pubic bone to your collarbones. Stay for just a few breaths or up to 1 to 2 minutes in the full pose. Step your back leg forward and return to Uttanasana. Then lift back up into Tadasana. This pose is great for strengthening the back muscles around your spine, which can help hold your back more upright. If you are new to the pose, start with 15-second holds and gradually work up to 1 minute. Start in a prone position with your arms by your sides and your forehead on the floor. Create a sense of length from your hips into both feet and from your tailbone up to the crown of your head. Keeping your pelvis and lower belly on the floor, inhale as you lift your chest, head, and legs a few inches off the floor and lift your arms toward parallel with the floor. Keeping your knees straight, reach your legs back as you reach forward through the crown of your head. To come out of the pose, exhale and release your legs, chest, head, and arms, returning to the starting position. Turn your head to one side and rest for a few breaths before repeating. This pose is last in the sequence so that you will be very warmed up to stay comfortably in the backbend for longer periods of time. This will allow you to relax completely into your supported position and enable the position and gravity to take full effect in opening your front body. Start by holding the pose for 1-2 minutes and gradually work up to 4-5 minutes. To come into the yoga pose, use your hands to guide yourself back and down onto a bolster, arching your spine to bring your head down onto the floor just beyond the bolster. The bolster should support your upper back, with the lower tips of your shoulder blades on the center of the bolster. The tops of your shoulders should hang toward the floor but not rest on it. If necessary, shift yourself forward or backward to achieve this alignment. If your head does not easily arch back to the floor, please add a folded blanket or block under the back of the head so the neck is completely comfortable. Next, bring your arms straight out to your sides, just along the top edge of the bolster, so the backs of your hands, and maybe your elbows, rest on the floor. You can keep your arms straight or bend at the elbows into a cactus position (as shown in the photo). Finally, straighten your legs along the floor. Firm your leg muscles and draw the balls of your feet back toward the tops of your shins. When you have finally aligned yourself in the pose, release the weight of your upper body onto the support and bring your attention to your breath. Breathe comfortably for 6-12 breaths and then try to deepen your breath for 6 additional breaths. 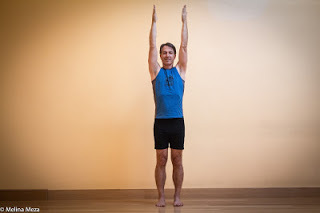 Gradually work your way up to longer holds, eventually holding the pose for up to 3 minutes. Deepen your practice and learn many healthy aging tips with Dr. Baxter Bell on our premium practice channel. 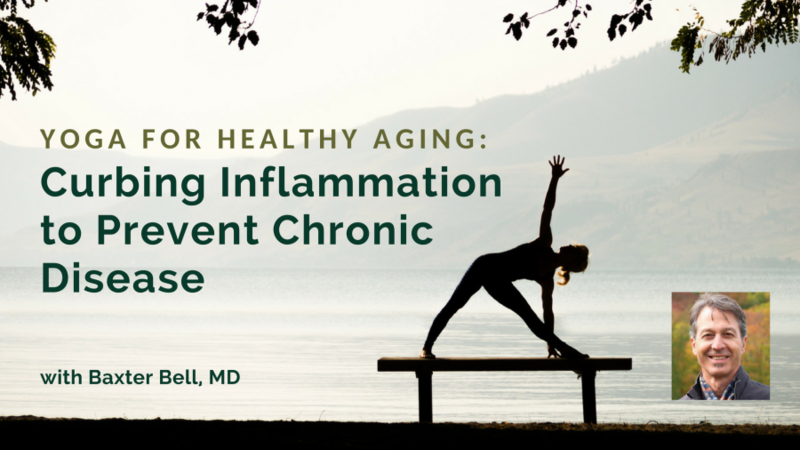 Study with Dr. Baxter Bell and YogaUOnline - Yoga for Healthy Aging: Curbing Inflammation to Prevent Chronic Disease. Baxter Bell, MD, C-IAYT, eRYT 500, is a yoga teacher and educator, physician and medical acupuncturist. These days he focuses on teaching yoga full-time, both to ordinary students of all ages and physical conditions and to the next generation of yoga teachers, to whom he teaches anatomy and yoga therapy along with his accessible, skillful style of yoga. Baxter brings a unique perspective to his teaching, combining his understanding of anatomy and medicine with his skill at instructing people from all walks of life and all levels of ability. Baxter is the co-founder and writer for the popular Yoga for Healthy Aging blog, where he shares his knowledge of medical conditions, anatomy, and yoga with practitioners and teachers across the world. In addition to being a frequent presenter at Yoga Journal Alive events and yoga conferences such as IAYT’s SYTAR, he is often quoted as an expert on yoga and health by major national news outlets such as The Washington Post and Wall Street Journal. To learn more, visit www.baxterbell.com, www.yogaforhealthyaging.blogspot.com, and his YouTube channel Baxter Bell Yoga. Baxter is the co-author with Nina Zolotow of Yoga for Healthy Aging: A Guide to Lifelong Well-Being.